Hi, I’m Grady Dixon a weekend guide and museum store employee at the Red Skelton Museum of American Comedy. Born in 1956 means I’m right in the heart of the baby boomer generation which also means I grew up watching Red every Tuesday night throughout the entire 60’s and until CBS took Red off the air in 1971. These evenings were so very special to me as a child because Red brought so much laughter to me and I cackled the entire time he was on TV. Of course my homework had to be done or I was not allowed to watch Red so, at least on Tuesday nights, my homework got done. I have had the privilege of working at the Red Skelton Performing Arts Center while a student at Vincennes University beginning in January of 2011; I went to college late in life but, better late than never. 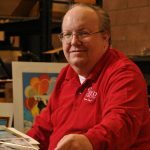 In the fall of 2013, our President of the Red Skelton Museum Foundation, Anne Pratt, asked if I would be interested in working part time on weekends in the museum. This was a no brainer. During the past 3 ½ years I have spoken to thousands of Red Skelton fans from all over the U.S., and some from other countries, who also have an affinity with Red Skelton. Hearing stories from those who had either met or seen Red in concert, well I am all ears to each and every story. And with every story my love and adoration for Red’s comedy and humanity grows. All are very alike yet, each with its own unique flair. So for those of you who will in the future decide to come off the beaten path to the museum please bring a wonderful story of your experience with you of having met or seen Red in concert. And, for those of you who decide to come and don’t have a story, we will reminisce together about our childhood laughter watching Red on Tuesday nights. Bring Kleenex because there may be a time when you get the a bit misty, I do I’m not ashamed to admit, while thinking about all the wonderful childhood memories of Red.